These three stocks can stand the test of time. When it comes to investing in the stock market, the only strategy that's a proven winner is buying and holding high-quality stocks for long periods of time. But it can be a significant challenge to pick stocks that can withstand the inevitable shifts in both investor sentiment and market dynamics. With this problem in mind, we asked three of our contributors each to select a stock they think are up to the task. They suggested Johnson & Johnson (NYSE:JNJ), Brookfield Renewable Partners (NYSE:BEP), and Berkshire Hathaway (NYSE:BRK-A) (NYSE:BRK-B). Read on to find out why. Despite its long history of trouncing the broader markets and delivering top-notch returns on capital, though, the company's slight first-quarter miss on its all-important pharmaceutical sales -- $8.25 billion vs. the consensus estimate of $8.47 billion -- still managed to spook some investors. The overarching concern is that pharma products within the U.S. may start to lose their pricing power moving forward -- especially within the highly profitable specialty-medicines segment of the market. Unfortunately, the unsightly 9.5% drop in sales of J&J's prescription blood thinner Xarelto in Q1, due, in part, to the "higher discounting in managed care and government channels for preferred access positions," only reinforced this growing fear. 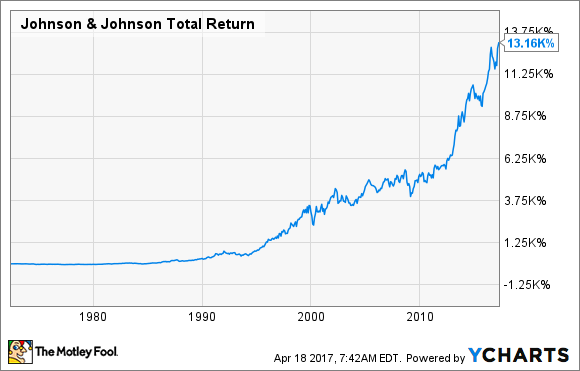 I think this potential headwind is way overblown at this point, and J&J remains a great stock to own for the long haul. The heart of the matter is that J&J is actually forecasting top-notch sales growth on an operational basis within its pharma segment this year, powered by high-value products like the cancer drugs Darzalex and Imbruvica. And the generic threat to J&J's top-selling anti-inflammatory drug Remicade isn't materializing quite as expected -- presumably because of the reluctance of physicians to readily switch patients to an unfamiliar biosimilar product. Coming full circle, J&J has stared down both perceived and real threats to its top line in the past, and basically nothing has yet to really slow it down. That's why this healthcare stock is a favorite among investors with a long-term outlook, and this situation isn't about to change due to some short-term drug-pricing headwinds. Matt DiLallo (Brookfield Renewable Partners): With climate-change worries growing, it's creating the incentive for the world to invest in expanding renewable energy power sources. That includes building not only more wind and solar plants, but also more hydropower facilities. Those trends play right into the hands of Brookfield Renewable Partners, which is one of the largest renewable power operators in the world. Currently, about 85% of Brookfield's portfolio consists of cash-flow-gushing hydro assets. However, the company has a growing wind business, and recently made its first large-scale solar-power platform acquisition. As a result, the company now has three renewable platforms to build upon in the future through a combination of propriety projects and additional acquisitions. Speaking of projects, the company already has several needle-moving hydro and wind facilities under construction, which provide it with clearly visible near-term growth. In fact, Brookfield's organic growth potential alone supports its belief that it can increase its already generous 6% distribution by 5% to 9% annually over the long term. That puts the company on pace to meet its objective of delivering annualized total returns in the range of 12% to 15%. That's a pretty healthy return projection for a lower-risk company. It's that combination of compelling low-risk returns in an industry set for continued expansion that makes Brookfield Renewable Partners a great stock to buy and hold. I do believe that the American economy is a good bet to survive and thrive forever, however, and if there were a way to do that -- to buy and hold forever one single titan of American industry -- then that's something I'd be interested in owning forever. Fortunately, I happen to know of one stock that fits the bill: Berkshire Hathaway. Oh, I know. Most people who invest in Berkshire Hathaway these days do so because they hope that Warren Buffett is magic -- and many people who don't buy Berkshire don't do so because they fear that Warren Buffett is mortal, and his magic must one day end. As for me, I place my trust in both sides of the equation. One day, Mr. Buffett will go away. But the company he built will remain in place, and that company is a $215 billion-dollar-a-year business representing well over 1 full percentage point of American GDP. Encompassing businesses include everything from jewelry sales to furniture to insurance to candy making, Berkshire Hathaway stock is a sort of proxy for the American economy -- and more than that, a hand-picked assortment by Buffett of the very best companies participating in this economy. And more than that, it's a widely diversified basket of such hand-picked companies that can survive the obsolescence of any one of its constituent companies as technological changes take their toll over time -- up to and including jet packs.